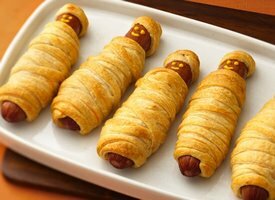 Making Mummy Hot Dogs for today’s Halloween festivities. Aren’t you jealous? If you want to make your own, go here. Back on Monday with a Halloween wrap-up post. Just in time for the post-Halloween sugar coma. those are awesome!!! what a great idea.